No End In Sight provides the best argument for the value of the perspective it provides. 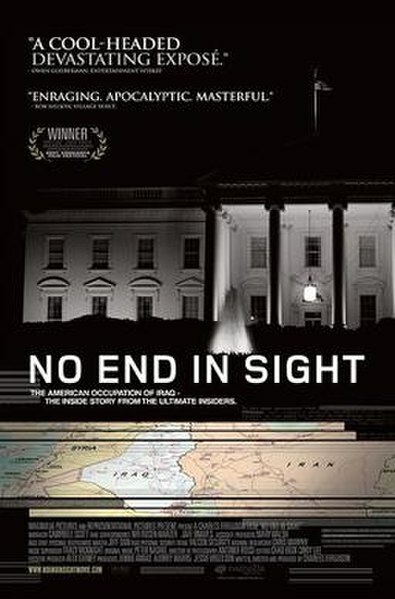 If the Bush Administration had approached its ill-conceived reactionary military venture in Iraq with the sobriety and clear-headedness with which this film approaches their astounding failure to do so, perhaps it would not have been such an astounding failure and this film would not have been necessary. Perhaps one more left-wing documentary exposing the destructive hubris of the departed and well-and-truly repudiated Republican administration is not nearly as vital today as it might have been in the waning days of the Bush Era. The flood of insider accounts of what these irresponsible neoconservatives ideologues have wrought upon their country and the world had long surpassed critical mass even by 2007, but the stunning thing about the Bush cabal’s governance of malfeasance is that there always proved to be more dumbfounding tales left to be told. Charles Ferguson (who later oversaw Inside Job, a similarly calm but steely documentary on American overreach, a few years later) packs his film with these incredible but true stories. No End In Sight shows how the policy structure for post-war Iraq was being set by people with little to no direct experience of the region, many of them who had never even set foot in the country, did not speak Arabic, and had little to recommend them beyond ideological suitability. Many key positions in post-invasion Iraq’s provisional authority were filled by fresh-faced College Republicans with even less expertise than their bosses. Most disturbing was the still-baffling decision to disband the Iraqi military, which removed a potential ally in securing a volatile situation and practically invited legions of armed and trained professional soldiers to convene an (or at least join an already-convened) immediate insurrection. Dozens of other missteps and errors are likewise revealed, most of which seem almost willfully wrong-headed, as if some spurious value was being attributed to devising the worst possible solutions to Iraq’s spreading problems. Ferguson’s resulting final documentary product is a powerful and quite nearly irrefutable condemnation of arrogant mismanagement that has cost hundreds of thousands of lives and trillions of dollars. Even after the withdrawal of American forces and the trumping of sectarian turmoil in Iraq by greater Middle Eastern conflagrations stemming from the Arab Spring, the pessimistic verdict of the title rings true enough. A quietly but profoundly devastating documentary.